The Powerline PFT100 is a similar functional trainer to the Body-Solid GDCC210. However, it has a simpler frame construction and its chin-up bar is straight, not curved. But nonetheless, it features the same weight resistance system, the same weight stacks, and the same adjustment. The Body-Solid Powerline PFT100 functional trainer features a full-steel frame construction, made of heavy-duty 11-ga tubes. The main rear frame bars, the bar that unites them, and both base bars are coated with a corrosion-resistant paint finish, dark gray in color. The front upright bars which provide adjustment for the moving pulleys feature a chrome finish. The guide rods of the weight stacks are also chrome plated. This functional trainer is not an extremely large strength training system. Its widest point is approx. 62.6″ (159 cm), while its depth is 42.3″ (107 cm). 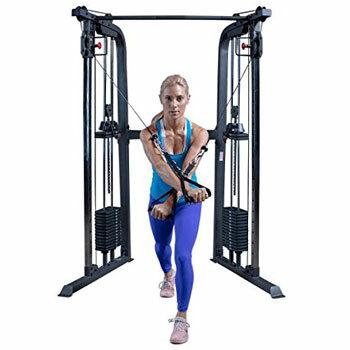 The distance between the two side pulleys is 52″ (132 cm), and therefore, the front section of the unit provides plenty of inner space for the correct execution of all exercises. The height of the unit is 83″ (211 cm). This being said, the unit can fit in a room with a 7′ (214 cm) ceiling, but in this case, you will only benefit approx. 1″ of clearance above the pull-up bar, so you won’t be able to execute all the pull-up or chin-up exercises correctly. Therefore, it’s recommended to assemble and use the machine in a room with a ceiling height of at least 8′ (244 cm). Also, it’s recommended to leave at least two feet of clearance on each side of the machine, and at least three feet of clearance at its front, for the correct execution of all exercises. The fully assembled unit, with both its stacks mounted, is considerably heavy. It weight approx. 477 lbs (216 kg). Therefore, once it is assembled, its movement is problematic; it’s not meant to be moved after assembly. But on the other hand, all this weight provides an excellent stability for the unit. Plus, both bases have holes for anchoring it to the floor if you think it’s necessary. The top section of the Powerline PFT100 integrates a pull-up bar. This is a simple, straight bar with knurling in the middle, in order to provide a better grip. It does not have the side curved grips such as the bar on the GDCC210 model. The weight capacity of this pull-up bar is not specified, but it should support at least 300 lbs (136 kg) with no problem. The machine integrates 16 fiberglass-reinforced nylon pulleys with internal ball bearings. Evidently, since it’s a functional trainer, its front pulleys are adjustable. Each front pulley assembly glides on its upright bar which provides 20 lock-up positions for it. The distance between the adjustment positions is 3.2″ (~8 cm). Also, each one of the front pulleys can swivel in a 180° range. Needless to say, this Powerline functional trainer is equipped with steel cables, which can handle 2,000 lbs of stress. The cables are covered by a sheet of nylon material which facilitates their travel over the pulleys. The only accessories included with this home gym are the two side handles. These are pretty standard D-handles with thick, rubber grips for optimal comfort. Of course, you can opt for various other accessories, such as folding benches, ankle cuffs, short handles, and more. 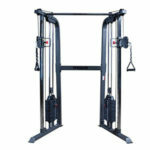 The Powerline PFT100 functional trainer is equipped with two weight stacks of 160 lbs (72.5 kg) each. Its weight ratio is 2:1, which means that if you select a weight of 100 lbs (45.3 kg) for one stack, the weight resistance that the machine will generate for that particular stack and side will be 50 lbs (22.6 kg). Each weight stack consists of 15 weight plates, each plate being 10 lbs (4.5 kg). The top selector plate also weighs approx. 10 lbs (4.5 kg). The weight plates are made of cast iron material. Needless to say, they are considerably more durable than cement/vinyl weight plates such as the ones on the Marcy MKM-81010. Evidently, the sturdiness of the weight stacks is reflected by the machine’s prices. It’s definitely more expensive than any similar unit with cement weight stacks. The machine’s weight stacks are upgradable. There is the option of 5 extra weight plates for each stack, which can upgrade the total weight of each stack to 210 lbs (95.25 kg). Of course, some of these exercises require additional accessories which are not included. For example, in order to perform an incline press or a seated press, you will need an adjustable bench. Leg curls require an ankle cuff. Seated rows can be performed by using the handles, but can also be performed via a short bar. The Powerline PFT100 has a rather standard, simple frame construction, so its assembly shouldn’t be too complicated. You’ll basically have to set up each side section of the main frame, connect them together, then add the weight stacks and their guide rods, install the pulleys and the cables. This may take a few hours, but the manual provides very clear assembly instructions and diagrams. The tools for assembly are not included. You will need a standard wrench set or adjustable wrenches, and a standard Allen key set. For maintenance, it’s recommended to periodically inspect the machine for loose or broken parts, and remedy any problem of this sort before any accidents can occur. The guide rods of the weight stacks require periodic lubrication for a smooth movement of the weights. The pulleys may also need lubrication from time to time. Other accessories such as ankle cuffs, or short bar, are not included. The Powerline PFT1000 is a standard functional trainer equipped with two 160 lbs cast iron weight stacks. It provides a 2:1 weight ratio, while its front pulleys have a swivel design and offer 20 adjustment positions. The unit makes available more than 25 exercises. It’s an excellent strength training system for home use, with an outstanding price/quality ratio.